Excessive sweating ... A source of great embarrassment for many people who can stop... Now! 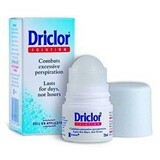 Driclor offers a clinically tested solution to help combat this so uncomfortable situation that you no longer need to feel inhibited to be happy! Driclor - Express your happiness without fear!